How Can I Prevent Water Retention During Pregnancy and Beyond? How can you prevent water retention during pregnancy? Preventing water retention during pregnancy is a big concern for many of us pregnant women. Is is possible to prevent retention, or is it inevitable to experience swollen hands, ankles, face, etc? Here are the steps that I put into practice during my own pregnancy to prevent water retention and avoid puffy ankles, fingers, or face. These tips enabled me to prevent water retention in the third trimester. Exercise, exercise, exercise! This seems like a no-brainer to me! Exercise helps increase circulation which prevents or relieves water retention and fluid build up during pregnancy. I work out every day, and I would recommend that every pregnant or non pregnant woman get at least 60-90 minutes of cardio (walking, jogging, swimming, etc) every day! Drink lots of water to prevent and reduce water retention during pregnancy! The recommendation is at least 8-10 glasses of water per day. 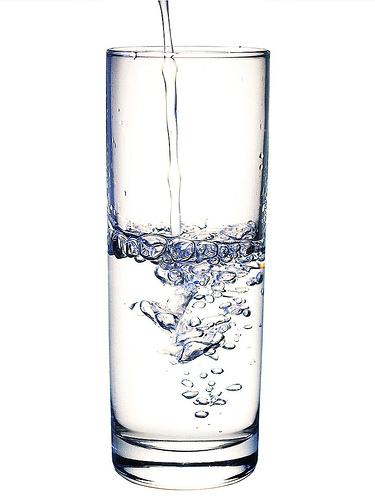 Drinking more water helps to dilute the toxins in your body. A lot of my clients prefer not to drink as much the day before a weigh in – this is a bad idea and will cause the opposite effect. Your body will start to store up/retain water if you do not hydrate enough (because it goes into survival mode). How do you know if you are drinking enough? Your pee will be clear. This tip is especially important to help reduce water retention in the third trimester of pregnancy. Prevent and reduce water retention during pregnancy by drinking more water! Eat a low-sodium diet to prevent water retention during pregnancy. Believe it or not, this is a controversial tip. Why? Because many argue that our bodies need sodium, and a low-sodium diet will not help in preventing water retention. Let me clear up the confusion. Our bodies DO need sodium, but a small very small amount. It’s almost impossible not to get enough sodium – however, in the rare instance that someone does not intake enough sodium, their bodies will start to retain water for survival. The adequate amount of sodium is between 250 and 500 mg/day. I usually hit that around lunch time. I have to be very conscious about how much processed foods I eat to prevent from going above the tolerable upper intake level (2300 mg). Cutting out excess sodium means much more than not adding salt to your veggies. It means being intentional about consuming more raw fruits and veggies, whole grains, fiber dense foods, etc, and less packaged, prepared meals and snacks. Log your food intake on caloriecount.com if you are curious as to how much sodium you have in your diet. You’ll be shocked! Eat more potassium dense foods during pregnancy. As mentioned above, most of us get far more sodium that we need in our diets…in the same way, most of us get far LESS potassium that we need in our diets. In fact, I have logged on caloriecount.com for months, and NEVER hit the recommended daily amount of potassium – not even once – and not even close. The RDA for potassium is 4700 mg per day. I usually get about half of that. And believe me, I eat lot of bananas! Potassium helps prevent your body from storing water, so educate yourself about foods that contain high levels of potassium. Hopefully these tips will help you on your journey to prevent water retention (whether you are pregnant or not). Let me know if you have ideas to help prevent water retention and excess weight gain during pregnancy and beyond. * Update to this post: I did not have any problems with water retention during my pregnancy! And my third trimester was in the heat of the summer! I only gained “baby weight”, and had no swelling in my ankles, face, etc. Phew! That was a relief. I truly think that exercising, eating low sodium foods, and drinking lots of water is what kept the swelling away! Best wishes. * Read an updated post on how to prevent and reduce water retention during pregnancy. I followed these tips and did not experience any noticeable water retention or a swollen face and ankles. Very helpful, Thanks!! I am only 12 weeks, but definitely hope I can beat the swelling during the hot summer months as I will be in my 3rd trimester. Jessica, I’m sure you can beat the swelling in the summer! I was 9 months in July. Talk about hot, but I don’t think I swelled too much – if at all. Just keep hydrated and keep exercising through the end of your pregnancy and you should do really well! Best wishes! Thank you for sharing this very helpful information. My sister is currently pregnant and this could be of use. Thanks again.